Your skin will become irritated, red, and itchy in the area where your specific trigger allergens are located. For example, your upper back might become red and itchy where pet dander was placed. Dust, pollen, and molds are the other most common allergens. An allergy shot contains a very small amount of the allergen responsible for triggering your allergy symptoms like sneezing, coughing, and congestion. 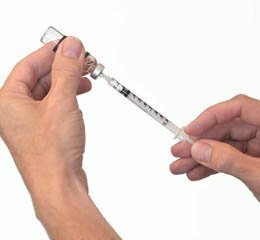 The shot is injected into the skin on your arm as frequently as once every week for the first seven months of your treatment. Allergy shots work just like other immunizations to help your body develop an immunity to specific allergy triggers. This form of immunotherapy makes it possible to breathe deeply on a cool fall day without any sneezing or coughing! Allergy shots are recommended once every week for seven months. This gives your immune system the weapons it needs to combat allergens. After the first seven months, you recieve your allergy shots once every two weeks, then once every four weeks. Most patients continue to receive allergy shots for three to five years. After five years, your allergist will likely recommend that you switch to a “maintenance” dose that is far less frequent but continues to support your body’s resistance to allergens. While the allergy shot treatment will not permanently cure your allergies, it will significantly diminish your symptoms and help you live your life to its fullest. Call (727) 300-2560 to make an appointment at Kratz Allergy in Trinity and Port Richey, Florida. Dr. Jamie Kratz specializes in immunology and the treatment of allergies, so you can trust him to help you eliminate your allergy suffering.